Credits: Crytek Studios. Important to note, these are NOT bullshots. Screenshot quality clearly similar to in-game visuals. I was given a private screening of the game at E3 on the first day, and what we were told, albeit limited in important information such as when the game might release, was humongous in terms of what the game wants to do. It seems like a game which takes elements from so many different sub-genres of action games to create something completely unique. The game consists of four teams of up to four players competing to hunt a target monster in each match. A developer for the game said the basics of each match’s structure boils down to: track the target, take the target down via a “banishing process,” then escape without dying. It was not exactly clear on how it works, but the demo we were shown had a team of two track down a shed where a pool of blood allowed the player to literally look through the eyes of the monster they were tracking. In the case of the demo I saw, it was a spider hanging from the roof of a barn. From there, the players have to find a barn where the spider might be hiding. They then kill that spider-boss (which is quite terrifying I might add, with it crawling all over at lightning speeds), and begin the “banishing process” which is really just defending the corpse of the spider from a wave of lesser monsters until the bounty for the target appears. The players then, with bounty in hand, have to escape the map without dying. The core mechanics of the game are that simple: find the target, kill the target, escape with the bounty. What seperates the game from being a horde-mode with bosses at the end is the PvP elements. Only one of the four teams will make it out with the bounty from the target. The teams can either avoid each other, or work against each other by taking other teams down to take the bounty for the monster target. You can take down other teams before even going for the target (more on why thats actually a bad idea later) or you can attack other teams while they’re performing the banishing process on the target, or even after they’ve finished so you can steal the bounty from them and run. There is a sense of strategy to fighting the other teams. While the depth at which you can sabotage other players does not seem to be very deep, the game is reportedly in early development still. As of now all you can really do to enemies is throw a molotov or two to block a doorway or bridge, or just shoot your enemy. The game had some environmental destruction, and destroying buildings or clues to the monsters whereabouts to impede other teams was hinted as a possible addition later in development. I personally doubt something that complicated could be done, as that would require making just about every building in the game destructible. Adding on top of those PvP elements is a reason to actually avoid other teams. When your team wipes (you can revive teammates) you are kicked from the session, and you lose your character. All you experience and money carries over to a new character, but you have to buy all your equipment and guns all over again. This would keep players from just going directly to PvP every game, because losing a match matters just as much as winning one. In terms of the game’s technical abilities, sound and lighting seems stupendously important. There were tons of different audio cues within the game which could say, hint to other teams where your team is located, or attract more enemies. Being picky with when you are willing to use a flashlight or fire a gun or other decisions was clearly important to the gameplay, making stealth a big part of the game. Some types of guns had suppressors, so they could be used more liberally, and some characters had clothing that made them blend into the environment better. What seems cool about this is that taking valuable gear like this into a match can be a BAD idea because when you get wiped by an equally-kitted team, suddenly you’re back to square one because you spent so much money on making your character stealthy. 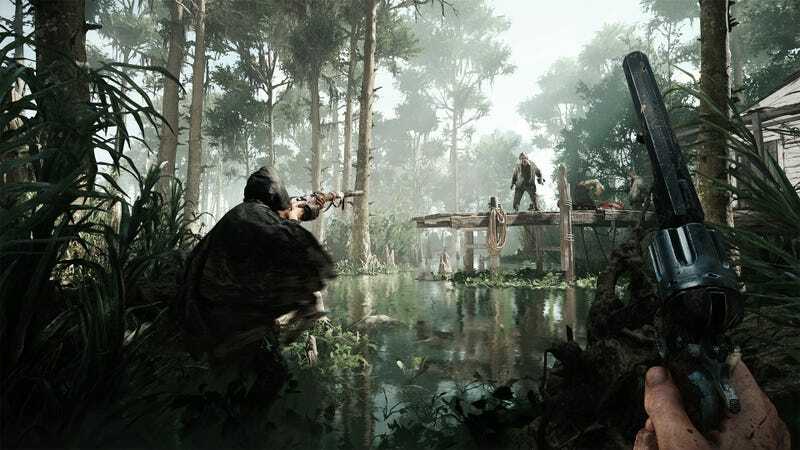 The game has a focus on what the developer called the “dirty corners of the world” in terms of map design, so a swamp in Louisiana was a natural choice. The map and game itself looked absolutely gorgeous. The demo was at night, so it really showed off how good the game’s lighting was, especially when the players threw grenades or molotovs. An issue I did notice which may be related to the game’s graphical tech is the low framerate which kept popping up in the gameplay shown. However, the game is in early alpha after all, and performance is not exactly paramount at the moment. As of now, thats all that’s known of Hunt: Showdown. When I asked, the developers were not able to say exactly how much content the game is going to have at launch, nor could they say anything about a release date. For now, the only content for the game in its current state besides the above screenshots is a 30 second teaser. The gameplay shown will reportedly be released shortly after E3, so when/if that is released I will replace the teaser with said gameplay.